Radio singer Joan Abbott (Storm) has been in show business all her life and wants to go to college. However, her uncle has the power to sign her to a radio contract when she is ready to leave for school. Joan runs away from the radio career and goes to college under the fake name Susie Smith. She meets school newspaper man Scoop (Downs) and frat boy wolf Buzz (Lowery) who vie for her attentions, much to the chagrin of Buzz’s girl Cynthia (Drake). Cynthia suspects Joan’s true identity and contacts the radio station. -The movie is about a radio singer and features real radio performer GeGe Pearson. -Candy Candido uses goofy voices in his musical numbers. You may recognize his voice as the voice to characters in some Disney films. 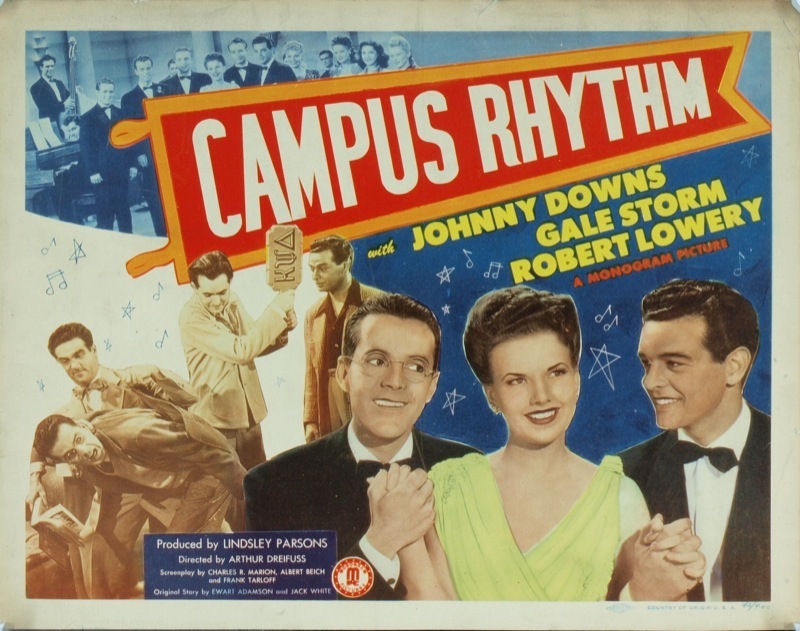 “Campus Rhythm” is a low budget film with a simple plot and several unfamiliar actors. However, it’s a lot of fun. Collegiate films are some of my favorite and this ranks pretty well. It’s full of 1940s fashion and music. This is a fresh little film and it’s 63 minutes worth watching. Also checkout our friend Raquel’s post on “Campus Rhythm” over at Out of the Past blog! This entry was posted in Musical Monday and tagged Campus Rhythm, Gale Storm, Musical Monday by Jnpickens. Bookmark the permalink.